Use of vintage eyepiece sun filters. I'm sure this will start a small skirmish but here goes. I have always known that you should never ever use the old vintage solar filters that screw into the bottom of a .965 eyepiece. I have never heard why though. I assume its that they might be old, cracked, dried up or otherwise fail to provide adequate shielding from the sun's rays that would be focused at or near the plane of the filter. Well I decided to give them a try as I wanted to see what all the concern was about. I have also always had a hard time with authority. I have several of these old filters and so I picked one in new condition and inserted it into a 60mm sears scope and pointed it at the sun. First I waited for it to start smoking. It didn't. So I slowly and carefully inched my eye up to the 18mm Tak LE ep and voilà. There was the sun. No heat, no blinding light. The only complaint is the false coloring. That was yesterday. Today I tried it with the same Tak ep but on my 4" AstroTelescope. Much nicer view as you would expect and it worked again without a hitch. So the question is why shouldn't we be able to use these inexpensive filers? I'm sure there is a large collective of experts on this forum who will "school me" on the errors of my ways! All of this said... I am not advocating that you try this at home. LOL, right after posting this I went back out to view the sun and what do you know. The little filter had developed a small crack and was letting a small amount of the sun's bright light through. That said this didn't happen with the 60mm yesterday. But with a larger scope it failed. In any case, the risk is there. So there you go! If you leave these filters in a scope pointed at the sun for an extended period of time THEY WILL CRACK! The sun filters work great however, they heat up and can crack or shatter. When this happens, it happens very fast. If you are observing and it cracks, there is a high probability that you will have highly magnified sunlight coming directly into to your eye - and there is no time to react. Some of the members of this group have personally experienced this. The only time it is safe to use a sun filtera is if it is used in conjunction with a Hershel Wedge which redirects most of the heat before it gets to the filter. There ya go! You obviously posted your second post while I was typing mine. Thanks for the birthday wishes. See my other post as the filter did crack. Fortunately when I was not looking through it. Sounds like a great idea Preston. therin lies the problem, if you are looking through one when it cracks your problems may b twofold, one is the magnified sunlight which can render you blind in an instant - or the infr red radiation can cook your eyeball. or when it cracks small slivers of glass could fly off and into your eye - neither of these is an enjoyable prospect. when we run solar observing we always have a marshall, whose sole responsibility is to inspect each scope for safety, before and during the session. 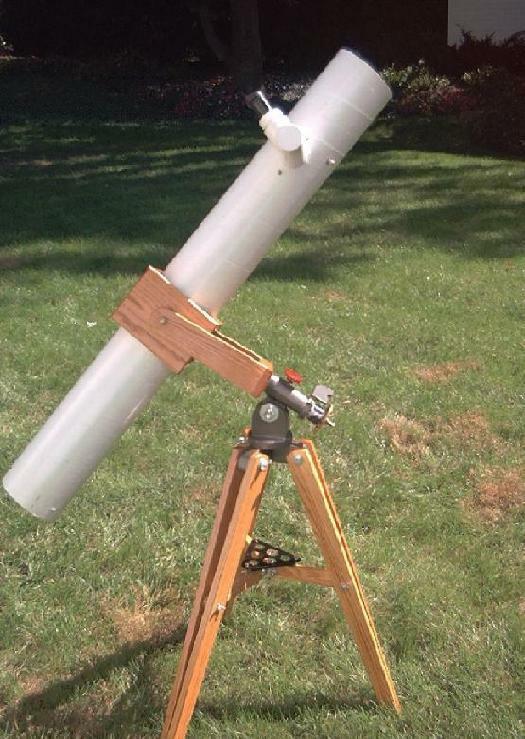 things that have been picked up vary from unfiltered finderscopes (which at best can result in burns to the forehead) to solar filters that could blow off the front of the scope. when I have performed this service in the past I carried a roll of black duct tape to make these things safe, taping the filters in place or taping over the end of a finderscope. Loc: In the dark desert of Eastern WA. Now, how safe are the solar filters criterion sold that looked like barlow's? I've seen on of them on here a while ago. Also how do you use a hershel wedge on a newt? Some of the old classic refractors had a dust cap with a smaller hole in the center to be used in combination with the sun filter...not foolproof but it at least sounds safer. I read somewhere that Galileo made his solar observations near sunset which also would be safer. Sunset doesn't block UV rays. That's where the danger is. Not in the visible spectrum. Picture a magnifying glass. You focus the light of the sun to start some dry brush on fire for your campfire. Now picture the magnifying glass as your telescope objective. How hot is the glass? Probably ambient temperature, maybe a little more. Now, picture the flaming twigs as your eye right next to the eyepiece. How hot is it there? That's why you don't use those eyepiece solar filters. You are correct that some of the scopes had an opening in the dust cover . My 11TR Tasco does .I believe that the sun lens works best with the aperture of the telescope reduced by the opening . For example , for a 60mm I have made a cover with a 30mm diameter opening. Sun lenses are not safe but they may be useable for short views for a few munutes . I had one split on me a long time ago using a Jason #311 60mm refractor . I saw that sliver of light and got my eye out of the way , but prior to that it heated up significantly . As stated the problem is that these filters crack. The reason is were they are placed in the optical path. When you screw them into the eyepiece they at or very near the focal plane of the telescope and of course that is were all the energy is concentrated. Many times this depends on the design of the eyepiece. If you place the filter away from the focal plane like on the front of the star diagonal then the enegery is spread out and heating becomes very much less of an issue. We all know that you can light a piece of paper on fire when placed at the focus of the telescope but move it an inch inside or outside of focus and all you do is make the paper warm. Also one has to understand that the size of the solar image the telescope produces also is a big factor. The size of the solar image is about 0.0092 x the focal length. So you have the relationship between size and energy. The smaller the image the more energy per unit area. So a long focus scope produces a bigger image that is less of a strain on the filter. You we have ever seen pictures of the solar osberving room at Mt Wilson, it shows a white light image of the Sun that is a number of feet in diameter, yet the table that the image is project onto doesn't burst into flame. As for the Criterion S-4 solar eyepiece, it is very well engineered unit. First it uses a barlow lens with one of the concave surfaces metallized. So the Sun light hitting this surface is divergent and can't come to focus inside the telescope. Since it's a barlow, it needs to be placed well inside the focal plane of the telescope, and not near the focal plane so it does not see any concentrated energy. Next there is a green filter similar to the ones we are discussing here. It is placed inside the focal plane of the barlow lens. So it can never see concentrated sunlight light. The green color is around 540 nm which is suppose to be the best for "white light" solar observing and this is wavelength that Baader uses in their "Continuum Filter"
If you want the best in white light solar observing, you build an instrument designed exactly for it. 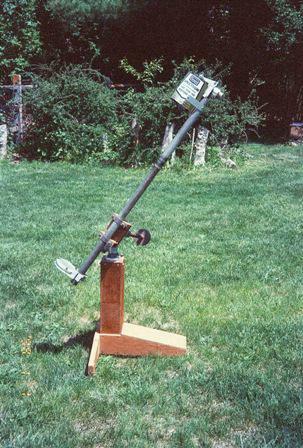 Here is a picture of my 4.25" f/10 Solar Newt, which uses uncoated optics and a built in Herschel Wedge. Dave - given that offset from the focal plane - what would be the max-size aperture that could be safely used with the Criterion S-4 barlow-filter - and for how long? Since it would be positioned in front of the diagonal on a refractor, I assume a hershel wedge would not be used here? In 1962 I purchased a Tasco 9TE, 60mm, f = 700 refractor. It came with one of those little dark glass “SUN” filters. The dew shield cap didn’t have one of those little pop out plugs so to use the filter necessitated the use the full 60mm aperture. I used that sun filter many times with the H12.5mm and H6mm 0.956 eyepieces that also came with the scope. In fact, I once used it every sunny day for an entire spring month for a 7th grade science project. Each day after getting home from school, I would draw the sun spots I observed in a note book. I use to enjoy the views that sun filter gave of the sun. One day, not long after turning in that science project, I decided to once again check out the sun spots. As I was about to screw the filter into the eyepiece threads, I dropped the filter on the cement sidewalk and the glass broke into little pieces. “Darn it,” I thought to myself sadly, “now I no longer have a sun filter.” I still have the body of that sun filter without the dark glass of course. 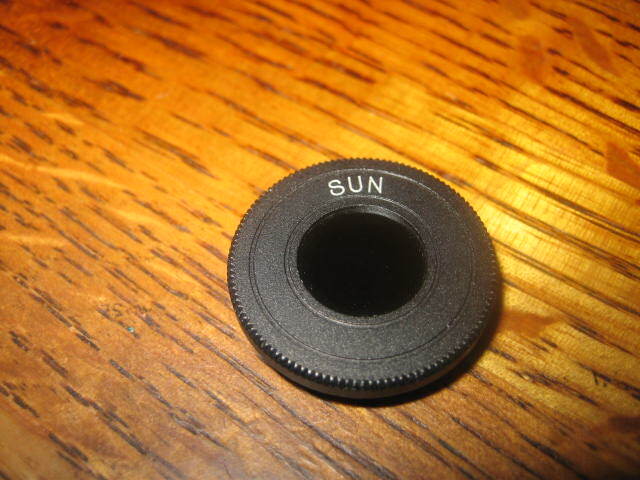 Sometime in the late 1970s, I learned how dangerous those old sun filters could be and I considered myself lucky that it broke on the cement sidewalk instead of while observing the sun. Last December, I purchased a 1960 Tasco 7TE which came with the exact same dark glass sun filter. The 7TE also came with a sun projection screen. While it’s nice for old time sake to have the little sun filter, I certainly do not plan to ever use it; however, I might try the sun projection screen someday. I also have some that mylar sun filter material that is suppose to be safe to observe with if it is put across the front full aperture of the objective lens. I purchased it to observe and videotape an annular eclipse back in the 1990s but I didn’t like the views using the mylar sun filter as much as I remembered the views using the Tasco glass sun filter so many years ago. Might be fine. Might not. The only safe filter is an aperture filter. Period. My old Vixen 80mm f/11.4 refractor came with such a filter and the telescope cap has a smaller one on it with a label underneath "Use it when observing the sun". I considered it safe because it was given with the telescope as a standard accessory and used it many times without any accident. I consider myself lucky though! I plan to use it to photograph the sun with a digital camera so there is no danger to make any harm to my eyesight if it breaks. The focusing can be accomplised with the aid of the camera monitor. So these filters can have another use today. The little Sun filter was designed for use with a 60mm objective (or smaller) and you overloaded it with the light from a 100mm objective!Seriously ,it was subjected to 2/3rds more heat ;there really is a lot of energy in sunlight. Criterion recommemded that you stop your telescope down to 3". With the optical design of the S-4 being a barlow, the optics have to be placed well inside the focal plane to have an image to come to focus. So by design it is difficult not to use this device correctly. Since one of the surfaces is mirrored and it used well inside the focal plane, it doesn't heat up. You don't use it with a Herschel wedge because the solar image would be too dim. After reading this post I had to dig out one of my old Sears manuals to see what it said about the Sun filter, It does say to screw the filter into the eyepiece! I had never realized this as I was taught back in the 60's to always screw it into the diagonal by an older astronomer friend of mine for just the reason of keeping the filter out of the focal plane to avoid over heating the filter. I'm glad that I had someone to instruct me instead of just reading the manual back then. Not the first time I have pushed things too far! I'm going to set up the 60mm again today and run some further tests with additional sun filters I have. I will report back the results. Jon, if you have a digital thermometer, you might instrument the filter to see just how hot it is getting. It might surprise us all how hot this really gets. The reason its breaking the filter is that the thermal load is too high and the heat has nowhere to go, so it builds. Also, the glass starts out cold, so there's likely thermal shock that's occurring. Neither of which occurs in a full aperture situation. This is a good question and thanks for asking it. I do have a followup to it. When these filters were new, '50s, '60s, '70s, and etc. were there a lot of failures? Are there a bunch of budding amateur astronomers from this era with damaged eye/eyes? Is it because of the age these filters become dangerous? Or is the warning that accompanies every post regarding these sun filters stated because folks may use the filter with larger scopes, (like Jon did) and discover that the filter will fail? Maybe it goes without saying but full aperture astro mylar filters are easy to mount and cheap. I have a more expensive 4 inch hard filter from One Thousand Oaks. Works great but is much more expensive than their mylar sheets.